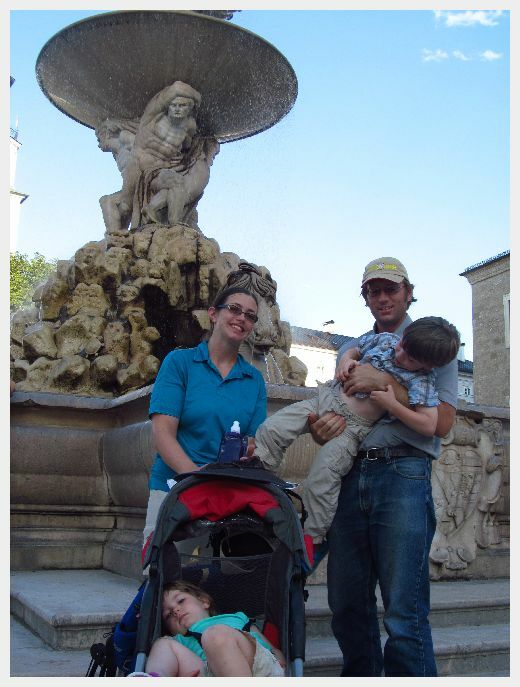 Visiting Salzburg with kids was one of the highlights of our Austria/Switzerland adventure! Salzburg is an idyllic, storybook perfect European city. 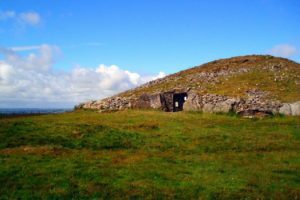 It has a beautiful fortress perched on top of a hill overlooking a meandering river below. Charming streets adorned with wrought iron signs beg for further exploration. 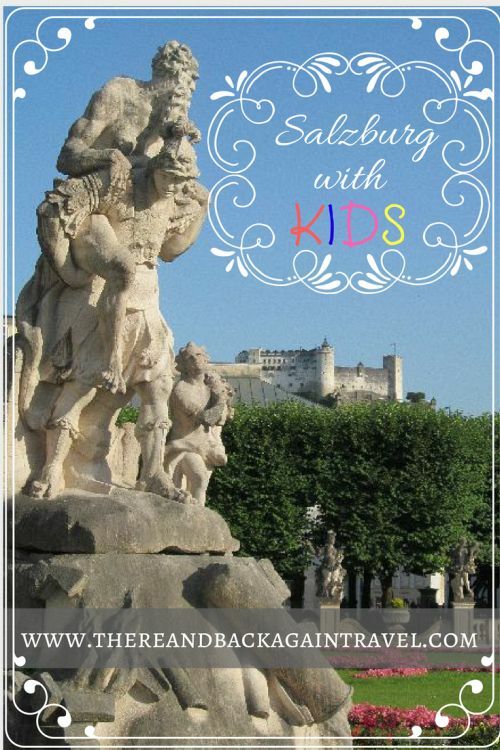 In addition to its high level of charm, we found a ton of things to do in Salzburg with kids! The size of the city was very manageable and easily walkable with kids. Many of the old town’s streets are for pedestrians only. This makes getting around to the top Salzburg attractions with the kids relatively pain free. The buses within the city were easy to use and on time with easy connections. If you are taking more than one ride in 24 hours (trust me, you will) it is cheaper to buy a 24 hour pass. Bus tickets are cheaper at the ticket machine than from the driver. Another tip – the back door of the bus is where there is an open place for strollers. Dining with the kids was relatively easy. If you have small children and just aren’t into taking them to restaurants Salzburg offers some great options. Many grocery stores have hot food available for takeout for a picnic. We even found some grocery stores have low key restaurants inside of them. This was a perfect, un-busy spot for dining with toddlers. Pizza is also readily available. 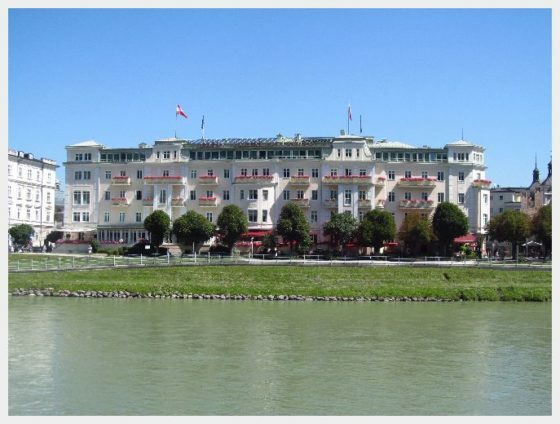 We found IDEAL family accommodations at the Meininger Hotel Salzburg City Center. They were also very easy on our overstretched budget! We booked a family room which fit our group of five perfectly. Easy bus connections, free breakfast and a shared kitchen make this an easy choice for a family. Click here for a link to my full review! Salzburg is on our short list of places that we would love to come back to! There were so many things to do in Salzburg with kids that we just couldn’t get to them all. We got to spend three days here but could have spent many more. This was such a lovely place to visit. There is convenient bus stop right outside. This is a logical place to start before meandering towards the Old Town for more exploration. The gardens were really pretty and this really is one of the must see Salzburg attractions to fit into your Salzburg itinerary. 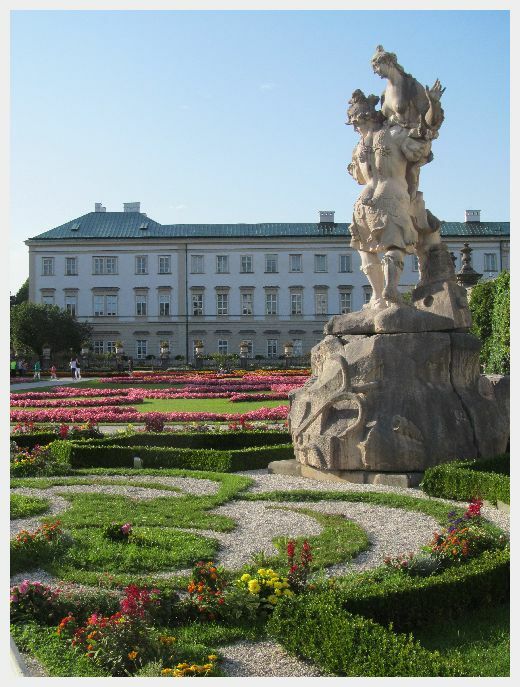 The Mirabell Gardens is one of the many locations made famous by “The Sound of Music”. 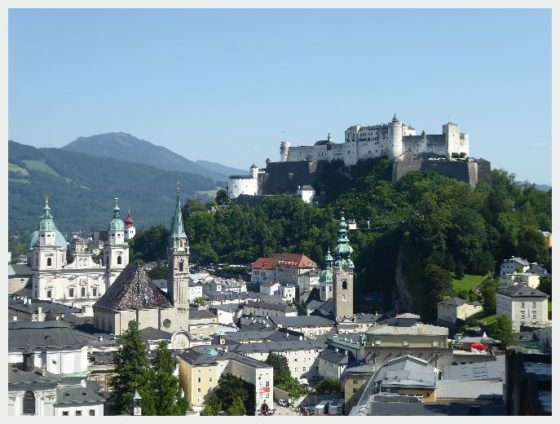 If you are a fan, a tour is a great way to see many of the filming locations in and around Salzburg in one day! *** One note about the Mirabell Spielplatz Salzburg (playground) – while the gardens did have a decent playground, the slide was REALLY tall and made of metal. It was a little too tall and too fast for us to feel comfortable letting our 4 year old go down. 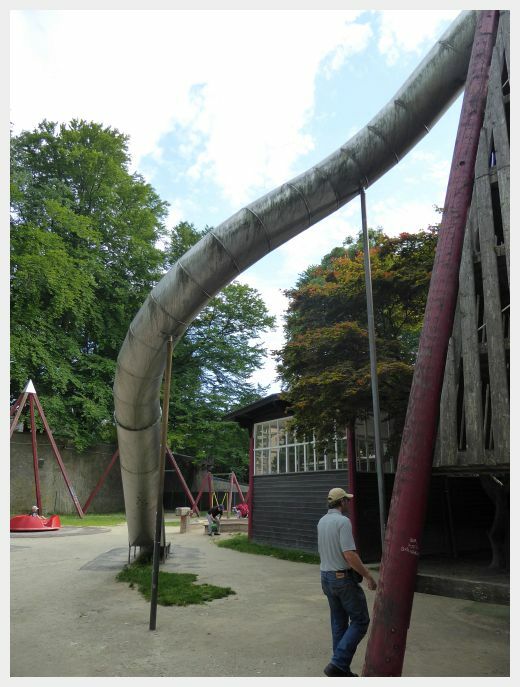 The giant climbing structure also seemed very dirty inside. If you aren’t going to let your little one go down the somewhat scary slide, you might want to set up their expectations ahead of time (if our kids had been wearing long pants, we might have reconsidered). The rest of the playground equipment was in good condition and fine for our 2 and 4 year old. It had some great swings and other interactive elements including a thingie with scoopers and buckets to move sand around that my 4 year old really loved (sorry, these are technical terms, I know, I just don’t know what else to call it). 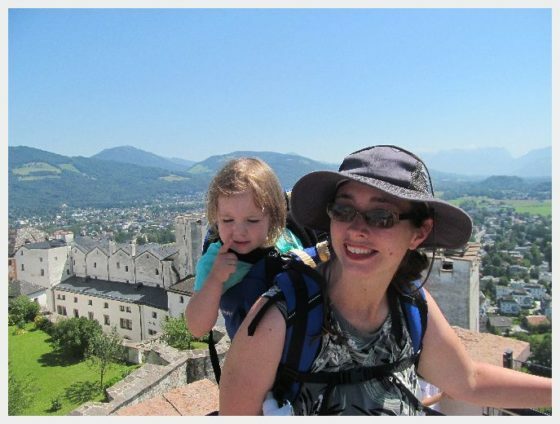 The fortress overlooking Salzburg is a fun place to visit with kids. There is an elevator to take you up to the fortress that leaves from the Old Town. Our 2 and 4 year old enjoyed exploring and play fighting with the cannons that looked out of the walls. The best views were gained by climbing to the top of the tower (not quite correct…the 4 year old climbed with some coaxing…the 2 year old rode on my back). Admission and elevator ride are included with your Salzburg Card*! 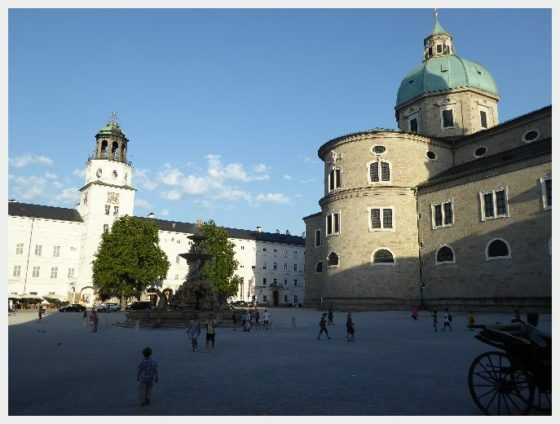 You will inevitably run into this beautiful square underneath the Salzburg Cathedral as you are wandering around the old town. The square is a big open space with a beautiful water fountain in the center. Our kids had fun looking for various little animal carvings hidden in the fountain. In the evening, the square did not have many people in it so the kids could run around and stretch their legs a little. It was also shaded at this time from the heat of the summer sun. It would be a nice place to stop and sit to enjoy a picnic dinner or a treat! ***A note about how much you might be able to fit into one day if you are visiting Salzburg with toddlers or kids: We walked around Mirabell Gardens and the Old Town/Domplatz the afternoon that we arrived, and got an early start at the fortress the next day. You could do all of these in one day if you got an early start, as they are all in close proximity to each other. The Fortress was hot in the summer, so my recommendation is to go here early in the morning or later to avoid being here during the hottest part of the day like we were. The Haus der Natur Salzburg is a really satisfying natural history museum tucked right into one end of the Salzburg Old Town. The museum admission was included in our Salzburg Card. It was one of our kids’ favorite memories from the whole trip! 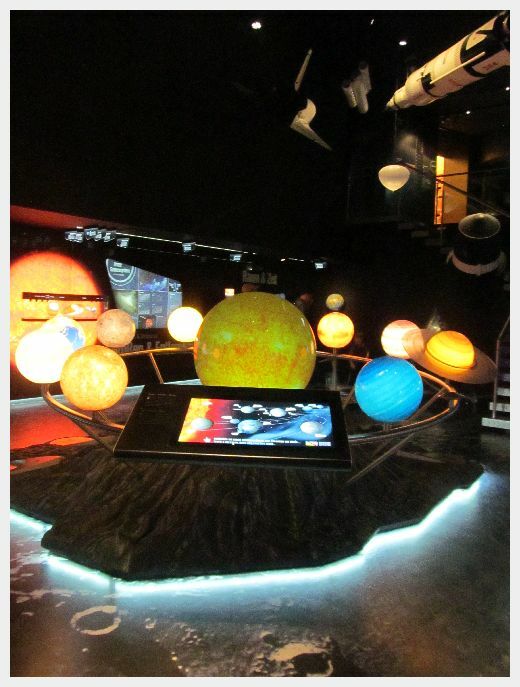 My son loved the planet exhibit and the human body exhibit. My daughter remembers the moving dinosaurs from the dinosaur area. The museum also had an aquarium and some small animal/reptile exhibits. The Haus Der Natur Salzburg was not huge. It felt very doable as a morning/afternoon activity for those visiting Salzburg with toddlers or kids. The exhibits were well put together and many were perfect for our toddlers. The Hellbrun Palace and more so its gardens full of trick fountains are sure to be a hit with your kids! Even better, during the summer the palace offers guided tours later in the evening as late as 9:00pm! This is a nice way to spend time if you are jet lagged and not quite ready for bed like we were during he first few evenings of our trip. 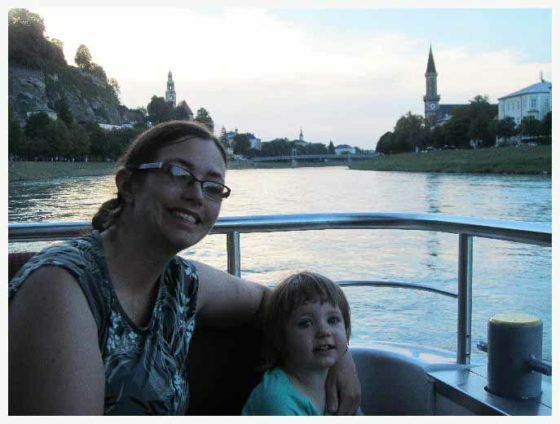 A Salzburg river cruise is a nice activity with the kids (AND if you have a Salzburg Card*, the Salzburg river cruise is included! We did pay the extra few dollars to get a VIP seat on the boat in the back for better pictures). We did this in the evening and when it was over, we were already down on the river to get some lovely pictures of Salzburg and the fortress lit up. Red Bull Hangar 7 is a great place to stop of your kiddos are into airplanes and race cars. This unique aircraft museum is housed in a glass hangar at the Salzburg airport. For night owls and those suffering from jet lag, it is open until 10:00pm and is free of charge. Café Wurfel Zucker was recommended to me as a great place to stop of the iconic Austrian dessert – Apple Strudel! The strudel here comes with ice cream and a luscious vanilla sauce. Eisgrotte Salzburg is summer staple in Salzburg. They have a couple of convenient locations – one of them right in the heart of the old town. Distracting the kiddos with ice cream is a perfect tactic to buy yourself a little more time to explore the adorable streets of Salzburg’s old town without fussing! This was the place where the famous Sacher Torte was invented. The Hotel Sacher is located directly across from the old town in Salzburg and they have a store where you can get one of these amazing chocolate cakes to go and enjoy on a picnic (where the kids have room to run and burn off the extra sugar). Losteria Salzburg is a pizza and pasta restaurant located just off of the Linzer Gasse in Salzburg. It was recommended to me by a local. Do what the locals do – get your pizza to go and enjoy it with the kids down by the banks of the river! *** If you are feeling ambitious or you have older kids, there is an entrance just up the street from Losteria Salzburg restaurant into the old city wall. 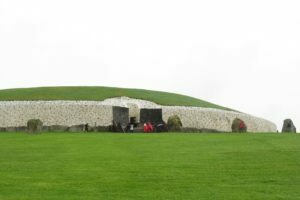 If you go through this and go up the path, it will yield panoramic views of the fortress and the old town. * The Salzburg Tourism folks provided us with Salzburg Cards for our stay (Salzburg Tourism is also a great resource if you are looking for suggestions for things to do in Salzburg with kids). The Salzburg Card is a great deal and we would have purchased them on our own had they not been graciously provided. They cover nearly all of the attractions in Salzburg AND all public transportation and frankly, having them just made things really easy as we weren’t pulling out money to buy tickets all the time. Still need Salzburg travel guides? The fortress and gardens are great! Thank you for sharing! Your nice photos and tips inspire me to visit Salzburg as soon as I can. I like especially the tips about how to make money lasts more! I am so happy for you! I know that you are going to have an AMAZING time. Thanks for the nice compliment!